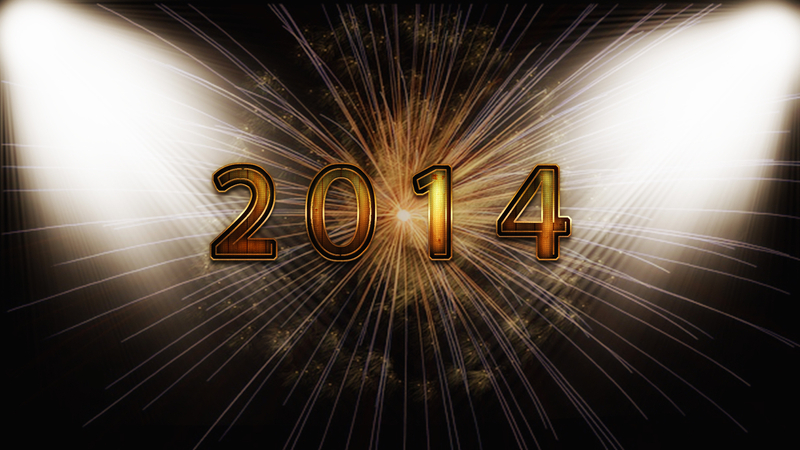 I don’t know how you feel about 2014 but I have mixed feelings about it. Several friends were diagnosed with life threatening cancer in 2014. So there has been lots of prayers and visits to different parts of the country. So far so good. This in turn made me get myself checked out. I’m not very good at going to the doctor – I average one visit every decade. But this time my visit turned into blood tests, scans and having a camera shoved up my rear end! Fortunately, it turned out I only have a slight problem with my prostate but nothing serious. Old age apparently. But remembering that gratitude increases happiness, what am I thankful for in 2014? At the beginning of May I finally gave up alcohol. And in September I gave up caffeine. These were two things I’d been trying to do for years, so well done me! (Pats self on back). In November I began keeping a food diary again, which is the only way I’ve found to lose a bit of weight. I took more exercise this year specially cycling to work more. All that has given me an increased feeling of health and wellbeing, so I plan to stick with all of those things. These are things I sometimes have as New Year resolutions and then fail to achieve. Resolutions never work unless we are prepared for a change of lifestyle. Dieting for a coupe of months achieves nothing, if we just go back to unhealthy eating at the end of it. As ever, I am very grateful for a loving family and the friends I have, and all the great supporters for the work we do in Africa and the UK. I want to continue to take more simple steps to improve my life every month, so that the accumulated effect of these simple steps becomes transformational. 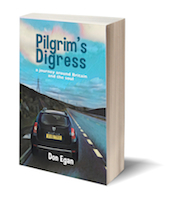 I’ll be putting together a FREE e-book and also publishing a more substantial book on Simple Steps to Improve Your Life in 2015. If you want the link to the FREE e-book, it will only be available to members of my email list. They also get a FREE extra thought on life improvement each month. One email a month. No SPAM. I NEVER pass on your info to anyone else. Period. One click unsubscribe option in every email. The UK government has woken up to our problem with gaining too much weight. In the end it will cause health problems and more so in later life. The last few times I went to the doctor for a health check he told me I’m obese. The comedy moment is that the doctors and nurses who broke the unsurprising news… were all about my size or larger! Many if not most seem to struggle with weight. Last year, over Christmas, I realised I had become overweight, was eating an unhealthy diet, and was taking very little regular exercise. When we did go walking in the countryside – one of our hobbies – I was getting breathless much earlier. As we approach this Christmas, I feel a lot healthier. So what did I do? I first lost over a stone in weight over a two to three month period in January to March. At the beginning of May, I began to tackle my three ‘addictions’ – caffeine, alcohol, and sugar. While I was tackling my three addictions, I took my eye off the ball on the weight front and put the weight I lost back on. That’s OK because I really wanted to kill some of these ‘addictions’ first. Now that they are overcome (though I’m still working on the refined sugar thing!) I went back to reducing my weight, and it’s working just as before. I can eat anything I want but there is a limit if I want to lose weight. It’s not rocket science. If you eat more than you use for energy, your body will store the surplus as fat. My magic helper to lose weight – don’t worry, I’m not selling anything! It’s a FREE app available to anyone with a smart phone or computer. You tell it your current weight, your target weight (start by just aiming to lose a stone. You can adjust it later.) And then log your food and exercise each day and slowly and safely, the weight begins to drop after a few days. 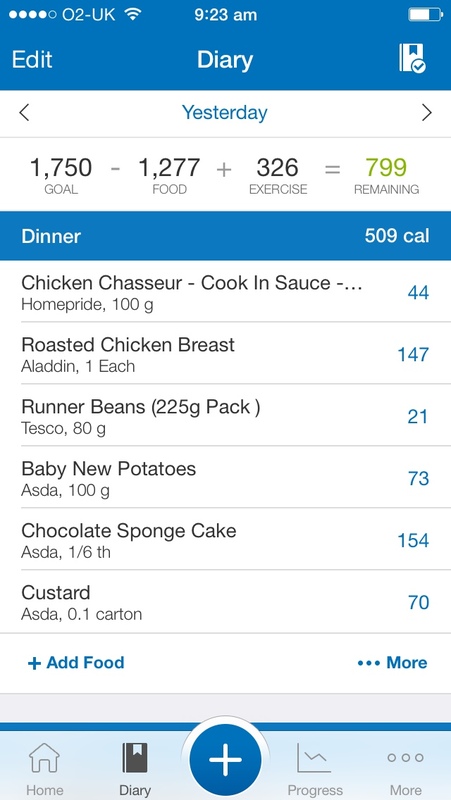 The app and/or website is myFitnessPal. You can download the app to your phone. Pretty much any meal you can think of is in their database and if it isn’t just enter the components of the meal. Going for a ten-minute walk? Log that in and it will up your daily allowance of calories. I recommend walking for 10,000 steps a day or as near to that as you can get. When you start, you may go over the target quite a bit like you can see I did! But this is the point. You can then see which items are the problem and eat differently. The week I started, I was on a road trip up North. When I stopped at the services, I saw they had my favourite junk food shop. A bought a steak pastie. Actually, I bought two! I had left it late to have lunch and felt hungrier than I really was. One would have done. Then I made it worse by eating a large chocolate bar as I drove. You can see which day it was as I went into the red on the graph. 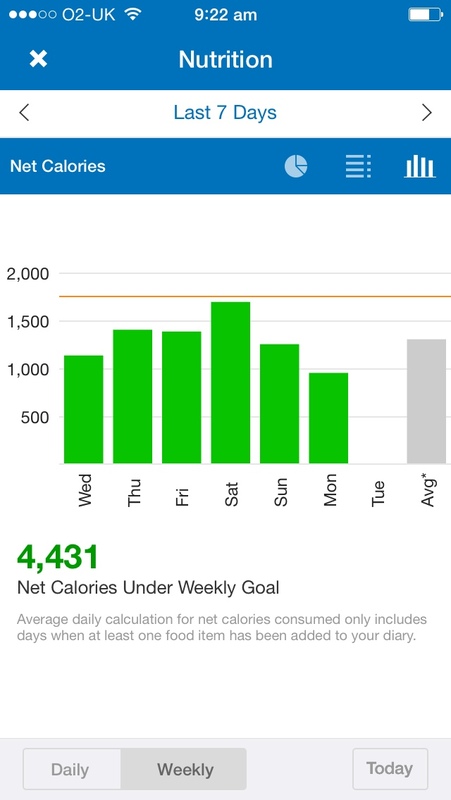 BUT over that week it was easy to pull it back so the weekly average was in target. This week has been more stable. Logging what you eat is the key to losing weight. I can easily eat two thirds of a packet of biscuits if I am not thinking about what I am doing. But when I have to log them, and see the empty calories, I manage to have one or two rather than ten! As you can see from this screen shot – we’re not having a lettuce leaf for dinner! Some of my family lost weight on organised programs. They were effective but costly. By contrast, MyFitnessPal is FREE. I have no connection to the app or its owners. 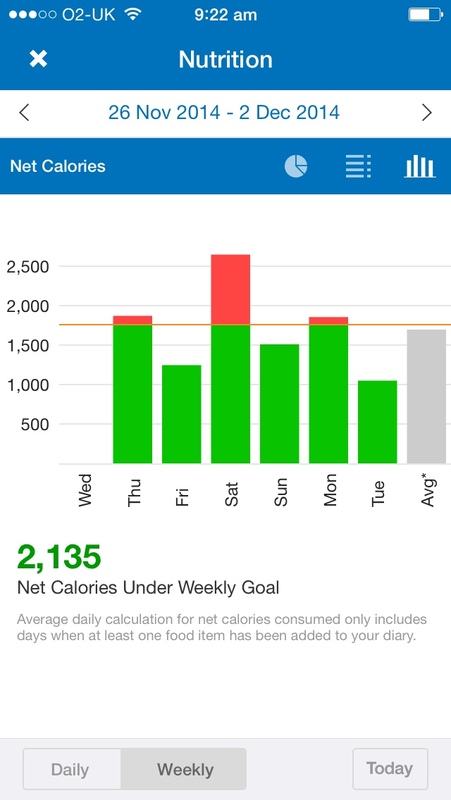 I am just a guy who was looking for a food-logging app and found a really great one. I highly recommend it. At the moment the weight loss is going as predicted – a couple of pounds or more a week. Another great feature is that you can link with a couple of friends and lose weight together, which is even more effective. Try it. Let me know how you get on!